The Windows Phone world has seen some pretty cheap handsets thus far, but they may all get outdone pretty soon - at least in Russia. 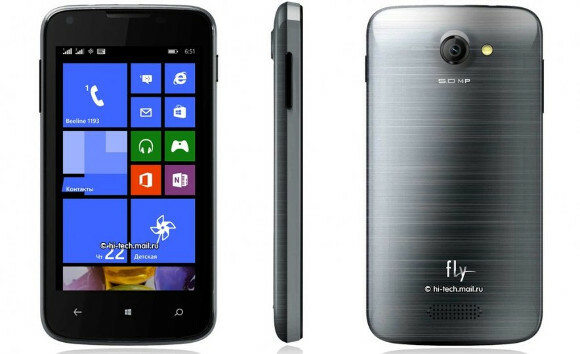 That's where the Fly Era Windows smartphone is supposed to launch in the coming weeks. This handset is said to cost just RUB 3,990, which right now amazingly translates into around $111 or €83. Even if it's not going to be the most affordable Windows Phone ever, the Fly Era will be very close, that's for sure. At this point you may be wondering what you'll be getting for that incredibly low price. Well, the Era shall sport a 4-inch IPS touchscreen with 480x800 resolution, a 5 MP rear camera with LED flash but lacking autofocus, and a 0.3 MP front-facing unit. The Fly Era Windows will be powered by a Qualcomm Snapdragon 200 SoC with a 1.2 GHz quad-core CPU, complemented by 512MB of RAM. It will have 4GB of internal storage, thankfully expandable via microSD cards. There's a 1500 mAh battery giving it juice, and in terms of software you should expect to see Windows Phone 8.1 running the show. The Fly Era's dimensions are 125.5 x 65 x 10.7 mm. It's still unclear whether it will ever be sold outside of Russia. Thanks for sending this in, Freddie! Well.... at first glance its an ok phone but i'm not much of an windows fan. I may be biased but their is just something that bugs me about it.